Launchpad couldn't import bug #36443 from freedesktop.org Bugzilla. 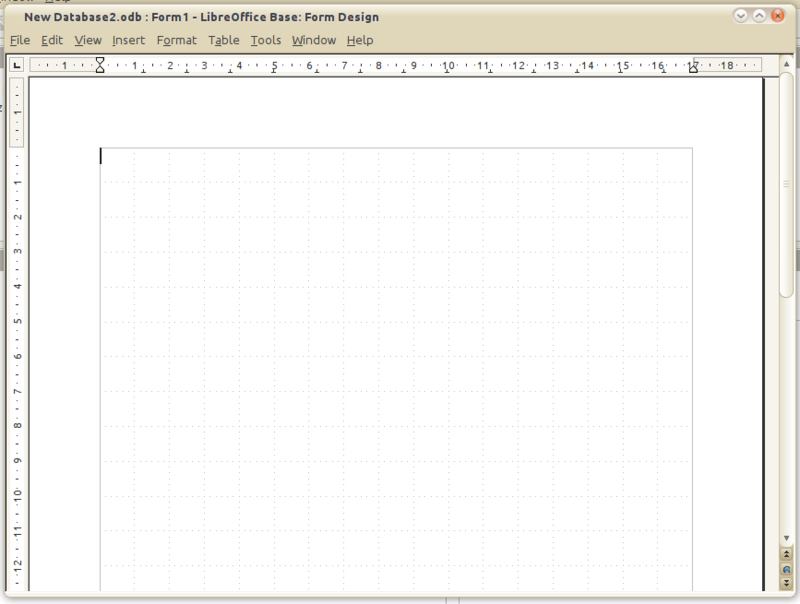 I use Libreoffice 3.3 final from libreoffice ppa, on Lucid. Trying to create a Form with Form design in LibO Base, it doesn't show toolbars. If I try to show them from menu, the first time someone appears, but if I close the window and reopen it, toolbars are hidden and I can't show them again. So Form design is now completely useless. UPDATE: the same problem is in Natty with Libreoffice 3.3.2. Oh... there is a side effect... now LibO Writer appears as in the attached screenshot! I dont' want to try debs from libreoffice website. so sad . hope for quick fix. debs package from libreoffice.org so fast than ppa. 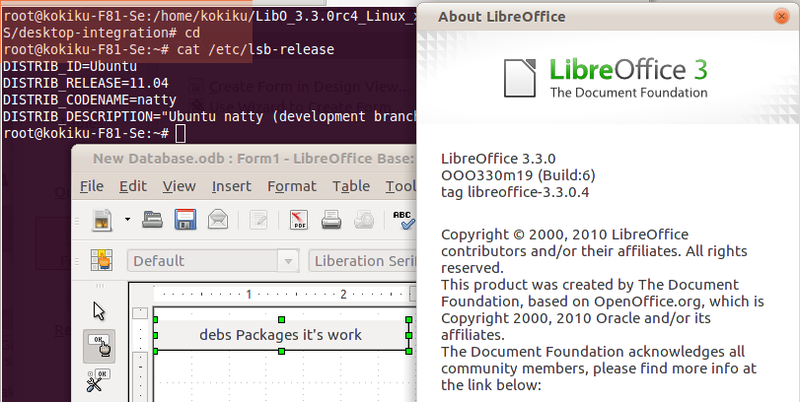 Using the ppa repository for Libreoffice on ubuntu 10.04. On a E-machines laptop, libreoffice installs and works perfectly well, including forms design editing. On my Dell INSPIRON 1011 netbook, again with Ubuntu 10.04, I have the same errors as above !!?? Worse stiil, I can't even use some of the forms in runtime mode, as for a few, as soon as a text box has some data added, and the return key hit, libreOffice crashes, and yet it doesn't on my E-machines laptop. I've had to go back to OO 3.2 on my netbook. As an aside, I have tried libreoffice on a WinXp virtual machine, and it works fine, I have also tried it on a fedora 11 tower PC, and all works fine, this issue only occurrs for me on the netbook, it is resolution or hardware based? any ideas. @Tony, I haven't experienced any crashes for some time now, purging previous data/installs is important before moving to the PPA install. Once you have purged / remove all existing previous OpenOffice.org and LibreOffice you can use the instructions linked above to install LibreOffice. Again, the issue is solely visible on the netbook running ubuntu 10.04, yet not the laptop, running ubuntu 10.04. As an aside note, reverting back to OpenOffice is not so straight forward. Removing libreoffice leaves behind lots of files, and also to get back to OpenOffice had to ure and uno-libs as well libreoffice, before OpenOffice would successfully re-install. I have tried this 3 separate times on my netbook, all to no avail, the same issue is hit everytime. I want to avoid installing the debs directly, as I want to use the repositories. I'm hoping this issue will be fixed soon, as until it is, I can't move to libreoffice on my netbook, at least not with ubuntu installed. Looking around, it appears that other people on other distribution are having similar issues, it's a real shame as it's not the best advert for libreoffice, or ubuntu when it happens, especially when the issue doesn't happen on certain other O/S's or hardware. I may try, OO 3.3, to see if that suffers from the same issues. hope for quick fix it , but deb package recomment with this problem. It appears to have gone quiet on this issue, and yet it is not fixed. At first I thought it was because the form I designed was a complicated 1, but alas that is not the case. I have since created a simple hsql embedded database, of 1 table, with 3 fields, including an auto increment primary key field. Used the forms wizard to create a form based on that simple table. On the fullsize laptop & PC, libreoffice base woks as it should, however, on 2 separate netbooks, an Elonex webbook, and a Dell inspiron 1011, the Elonex having a VIA C-7M 1600MHz processor, the dell, Intel(R) Atom(TM) CPU N270 @ 1.60GHz processor, the following occurs. However, when attempting to edit the form., you cannot get the form design toolbar to display, nor the form controls toolbar. Right clicking on a form control, will not allow you to edit the form control. Each of the laptops, and netbooks have Ubuntu 10.04 installed, and fully updated. Also, have Java 6 updates 22 installed, all other versions of java removed. The only thing I can think of that is appreciably different is the resolution ratio, as the netbooks have the screen resolution of 1024x576., but that may be coincidental. Please resolve this issue as soon as possible, or at least post regular updates as for when a fix is likely. Investigated further, and although the issues are less apparent on the full size laptop & PC, truth is, they are still basically unusable. Although, running better, I noticed that the value from a combo box on 1 form is not being picked up, and yet, the value from a combo box on another form, which was originally a copy of the form that isn't working, works as expected. Also, since attempting top use the failing combo box, I am now in the same position as before, of being unable to edit the form, or more specifically the forms. All of this works exactly as it should in OO 3.2, this release of libreoffice is looking increasingly like a rushed job, and is going to push users back to Windows and MS Office. Libreoffice, has been shipped with a severely broken Base component, rendering Base pretty much unusable. My other concern is, that unless it's fixed, all the other distro's shippping with LibreOffice 3.3 as default, will also in effect be shipping broken packages, which will only render any new linux experiences, less than optimal. Adding to Tony's remarks - I agree. Shipping 3.3 seems to have been a race between oo and lo, and has left base useless. It is shipping with these types of bugs disabling a package that makes it hard to rely on linux software as reliable - until these failures are a thing of the past. Something was broken developing 3.3. Be careful when fiddling with things that ain't broke. And let us have a fix, please, before we start to never try upgrades until somebody else has without problems for a year .. or two .. This is *not* a forum. c) you have a reliable workaround working with LibO PPA packages. Hi all, I'm not treating it as a forum, but posting as much information as I can that may help provide a solution. I have managed to install OpenOffice.org downloading from OpenOffice, and, following 1 change, to the OO Base file, OO Base 3.3 is now working as it should, on ubuntu 10.04 unfortuantely, LO Base 3.3, still has the issues mentioned above. Also, on the subject of the netbooks, it would appear OO 3.3 has a minimum display setting of 1024x768, which is unsuitable for a netbook, typically 1024x576. Just to test, I'm installing ubuntu 10.10, although this defeats the object of having an LTS ubuntu release, and will try again with that. If OO Base, and when fixed LO Base only work on resolutions 1024x768 and above, is definately a bad move, if it makes unusable on netbooks and other umpc's, you are effectively forcing users to, either use Windows & MS Office, or not use it at all. Poor show all round if that is the case. This has been the worse upgrade to OpenOffice, since before even version 1.0, I really hope that this is not a sign of things to come, and simply teething troubles to do with the split/fork. Unfortunately, since OO/LO 3.3 was released, Base at least is unusable on screens with a resolution of 1024x576. Which in all honesty is a shockingly glaring error, especially when taking into consideration the popularity of netbooks/umpc's. We use them alot with work, especially for those of us on call. Now the natural progression from here, is, that if OO/LO3.3 is useless on a netbook/umpc, then it's also useless on other systems where Base files are also going to be used on netbooks / umpc's. That being the case, the only real alternative to OO/LO, is MS Office. If using MS Office, there is no requirement to use either Hsql or MySQL to make the database portable, it makes sense to use MS Access. What follows then, is that, should the database grow too large for MS Access, the next logical step will be to go down the SQL Server route, again, negating the need for MySQL, or even Oracle DB. Tony: this bug report has a title. It is about toolbars in LibO. Almost 98% of your messages are about other things. I have the same problem on a Dell Optiplex 755 with a 1920x1200 screen resolution. Ubuntu 10.04, LibO installed from PPA yesterday. Following the Base tutorial in "Getting Started with LibreOffice 3.3", page 207. Neither the Form Design nor the Form Controls toolbars appear. They cannot be turned on from the View>Toolbars menu. The right-click context menu does not work either. I got round the problem with LO, on other resolutions, other than netbooks, by installing using dpkg from the official download, and not the PPA repository. Just remember, when uninstalling LO, there's quite a bit of manual cleaning up to do afterwards. What's a little frustrating is, I emailed Ubuntu direct, regarding this issue, and have had no reply as yet. Ubuntu Natty here, LibreOffice 3.3.1 from PPA doesn't show toolbars in Base Form Designer, but LibreOffice 3.3.1 from www.libreoffice.org show them always. I can submit screenies if you want. I can reproduce this all the time in two different computers, even after purging the LO DEB packages. Also, there is a tangible performance difference between the two versions, while doing database queries. I lack the knowledge required to properly report that as a new bug, so I would ask some guidance. How can I precisely benchmark the database query process? I see that the same issue is in Natty. Same problem as OP for openSUSE 11.4 on a Thinkpad x200 Tablet. same issue in LibreOffice 3.3.2. @Oscar than you for your short, concise summary of the problem (comment #21). I was able to reproduce the same problem in Natty. There is no PPA for Natty BTW, LibreOffice is the new default office suite in it. I also noticed said toolbars disappear and reappear consistently when using Full screen view (CTRL-SHIFT-J), when resizing the window in any way and when adding/removing other toolbars. So, they can be (inconsistently) added and used but they will disappear when resizing the window in any way. Adding more than one toolbar eventually shows them all but they disappear or don't "stick" when any other modification is made. Marking this as confirmed, medium importance. I've also tested this in 10.04.2 LTS using the PPA, same behavior. The summary says it all: The toolbars in LibreOffice Base 3.3.2 don't show up in the first place when you open a new form, or modify an existing form in design view in the Base component of LibreOffice. The same thing happens when you make or modify a report in Base. When I try to add a toolbar, it immediately disappears when I change the size of the window, or when I try to add a second toolbar. That's all I can say about this slight problem. I hope you can reproduce it. I am not very good at this, but I wanted to let you know about this minor bug. (sqlite-manager.googlecode.com), that works great for what I need to do. > for Natty BTW, LibreOffice is the new default office suite in it. > Marking this as confirmed, medium importance. Open form - no navigation-bar. Edit form - not possible. Same problem with LibreOffice in openSuSE: Editing of forms is not possible. Only the first time with the assistant base shows the toolbars. Another problem - could be the same: Navigation-bar is not shown. I have changed the platform to "All" and the importance to "high" and "major", because base isn't usable for editing new databases. Excuse me. I have tested it with the version of OpenSuSE. The original version of LibreOffice works well. Forms could be edited, toolbars appear and didn't disappear. I've got the same issues on Lucid 10.04.2. Renders Base pretty much unusable for development. The other problem I seem to be encountering is that the form widgets look really ugly using the Ambiance Theme. However, if I change to the ClearLooks theme everything looks fine. Also if I customise the Ambiance theme to use the clearlooks controls again everything is fine. Yes , I have this too, Kubuntu Natty with LibreOffice 3.3.2. Never had this before. Just checked on Kubuntu Maverich with OpenOffice 3.2.1 database editing forms works fine. 1920x1200 screen, Intel video, both cases. This bug has been forwarded to upstream freedesktop-bugs #36684. But there is no mention of this specific problem with the status bar / edit tool bar in Base. The solution of this bug is very important for me because I want to switch over from Microsoft Windows to Ubuntu. I'm working with databases and LibreOffice frontends. At the moment I can't work with the Linux version of LibreOffice. The windows version of LibreOffice doesn't have this problem. Confirmed on current master without any vendor patching. Confirmed on current 3.4 release branch without any vendor patching. Given that this was reported _not_ to happen on the 3.3.2 release without vendor patching, this is a regression. @Noel: Assigning to you for further info. As the bug was not observed in libreoffice 3.3.2 upstream builds, but was observed in OpenSUSE and Ubuntu vendor builds and is being observed in the current 3.4, this is most likely one of the integrated patches from libreoffice/build. Any hints on likely candidates for triage? > this is a regression. I'm joining this bugzilla, because I reported this bug to Novells Bugzilla für LibreOffice (#686354), but nothing happened yet. I first encountered this fault last autumn in the 3.3rc-Versions of OpenOffice; later in the 3.3rc of LibreOffice and all final Versions since then. Note that I always got Open/LibreOffice from the opensuse-buildservice. All corresponding native packages of Open/LibreOffices didn't show this effect, as you mentioned. So I assumed, it was a opensuse/Novell thing. For some weeks I noticed several reports of this issue in usenet by users with brand-new e.g. ubuntu-linux, so this seems to be not opensuse-only. It is slightly horrifying news, that this came into the pure LibreOffice code, because this will make work with databases completely impossible! Besides this, there is another problem with *existing* forms: control dialogs of form elements do not appear called by context menu. So after solving this bug, that would be the next problem. Bjoern would greatly appreciate some hints on which ooo-build patches might have caused this (Noel - any ideas ?). > have caused this (Noel - any ideas ?). So this is a Heisenbug or accidently fixed. On the launchpad bug you see people observing the bug on one machine, but not on a different one. I tested on the same machine. My money is on this being a Heisenbug. I wish I was already logging repostates of my builds last week. I will keep an eye on this one from now on. > same machine. My money is on this being a Heisenbug. The above discussion sounds like the problem is difficult to reproduce. In fact it is simple and quick and exactly as Björns comment 14. When opening a form to enter data there are no navigation bars, no tool bars and no status bar. You can only add a record by clicking on the last field and pressing enter. You can manually add the navigation bar, but it will disappear after close/reopen the form. You can not add the status bar. And if you try to add the formating toolbar the navigation bar will disappear. When editing a form there are no Form Design and Form Control toolbars. Also you cannot click a control to get to these tools, so you can not change your form at all, other then drag the control around a bit. I think more needs to be done then 'keep an eye out'. I just downloaded 3.3.2 Final (22-03-2011) (the deb version) from the LO web site, installed on a Maverick VM with OO wiped off. LO is same build OOO330m19 (Build:202). Guess what, here Data entry and Forms Editing work fine. This suggests a packaging problem in Ubuntu. Also NO problems here (with forms). So it actually does seem to be a packaging problem. But then one then occurs on multiple distributions - not just Ubuntu. Now what. None of the user with Natty installed is currently able to do any useful database work. We need a fix in Natty and quick too. @Ferry: No, this bug is _not_ easily reproducible. If you look at the launchpad bug some people have can produce the issue on one machine but cannot on another with the same version. Also this is not a "packaging problem in Ubuntu" -- it was most likely introduced by the go-oo patches that were applied as a de-fact standard by almost all distributions including SUSE, Debian, Ubuntu for the 3.3 branch. Those are some 500 patches which is why I asked about some hints which ones could be the problematic ones. On 3.4 these patches have been included in all versions including those directly available from the libreoffice website -- they are not patches anymore. As this could not be reproduced in the recent 3.4.0 rcs, we however still need to keep an eye out for it to pop up again as it might just be a Heisenbug that is hiding. In the Novell bug, optional-outplace-ole.diff is assumed to be the root cause of the problem. However, I just did a Ubuntu/Debian build without that patch, and the problem persists. additionally removed the patchsets Layout, VBABits, VBAObjects, LayoutDialogs, VBAUntested, but the bug persists. ignore the last two comments: I had an old soffice.bin instance running. it is indeed optional-outplace-ole.diff causing the trouble. I didn't mean to say that the problem would be easy to debug. Or solely a Ubuntu problem, as I am well aware that it happens at least on Debian too. I am glad you located the offending patch. Does it explain why "some people can produce the issue on one machine but cannot on another with the same version"? If I could have found a machine that didn't have the problem I wouldn't have been that desperate. I tried new installs, older upgrades, i32 and amd64, VM. All the same. I think some confuse the form showing 'read only' with 'cannot enter data in the form'. Will the 'rebuild' show up in the PPA? I can't wait to try it. closing as fixed as it is not reproducible in the current unpatched 3.3 and 3.4 branches. @Ferry: FYI, the fixed version is currently building in the ppa. I really hope, that this bug will not rise again in the downstream versions by ubuntu or in my case opensuse. How is this fixed? I have Libre Office 3.3.2 installed on my Ubuntu 11.04 machine and this is still happening to me. Works for me in (linux) 3.3.3 & 3.4.1. Still does not work in Ubuntu 3.3.2, so it appears to be a distro packaging/update/upgrade issue. Never been an issue with the plain native build. Fixed in 3.3.3 release which will be SRUed for Natty and all further releases on Ubuntu and Debian. Again: Please dont reopen, not an upstream issue, as not in the master repo. No the ppa has been rebuilt since #54. I have the same version as you (from the same ppa). But for me it still works. NACK: Package that is currently in -proposed regresses the icon theme. See LP: #813148. "Package that is currently in -proposed regresses the icon theme"
It is a very low important regression. If you can correct it in few days, ok, but if not please ignore it. version 1:3.3.3-1ubuntu2 uploaded to natty-proposed fixing LP: #813148. Any chance to release this fix for Maverick in the PPA? Shouldn't this bug be closed?